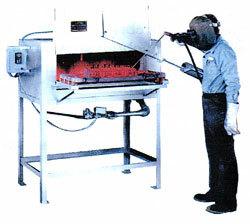 Our industrial series oven furnace is a Clydesdale workhorse among heat treating ovens. For use up to 2,000 degrees F, the FireBox-IS is insulated with 7″ of firebrick. Setting it apart from other heat treating ovens is its hand built staggered sprung arch, which was assembled brick by brick with careful attention to detail and design in our factory on Long Island. Use your FireBox-IS to heat tool steel, carbon steel, cast iron and other high temperature metals. Working area 24″w x 48″d x 14″h. Door opens 16″ high. Work load is 300 lbs. Maximum operating temperature 2,000 degrees F. Base list price with digital controls and high limit safety is $61,954. 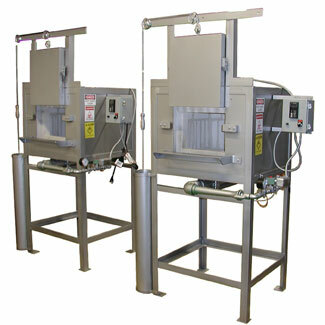 (Roll-out quench tank w/ lid and track available for an additional $6,000.) 12 standard sizes available from work areas of 18″w x 24″d x 10″h up to 30″w x 84″d x 16″h. Special sizes, roll-out quench tanks, air operated doors and fiber lined furnaces are built to order. Another heat treating equipment, the FireBox-HT is a high temperature furnace designed for both tool room heat treating and high temperature precision casting. For use up to 2,150 degrees F, the FireBox-HT is insulated with 4 1/2″ of firebrick backed up with an additional two inches of 1,200 degrees F block insulation. This heat treating equipment can heat tool steel, carbon steel, cast iron, and other high temperature metals. No. 1414S: Working area 14″w x 14″d x 8″h. Door opens 10″ high. Work load is 55 lbs. of steel. Maximum operating temperature is 2,150 degrees F. Base list price with digital controls and high limit safety is $14,047. No. 1818L: Working area 18″w x 18″d x 12″h. Door opens 14″ high. Work load is 75 lbs. of steel. Maximum operating temperature is 2,150 degrees F. Base list price with digital controls and high limit safety is $17,885. 6 standard sizes available from working area of 14″w x 14″d x 10″h up to 18″w x 23″d x 14″h. Special sizes, roll-out quench tanks, air operated doors and fiber lined furnaces are built to order. We are pleased to introduce our new Buzzer 450°-1350°F oven type Roll-Out furnace, designed for automotive engine rebuilding and ideally suited for cast iron and aluminum engine head repair. Charles A. Hones, Inc. designs and manufactures the kind of burners and furnaces industrial manufacturers can rely on to be resilient and state of the art. We strive to bring our customers heat treating equipment with specialized features for improved safety and performance. Searching for a heavy-duty cast iron gas burner or furnace? Since 1911, we have maintained our good reputation by providing outstanding customer service and by producing excellent industrial quality heating products. Our unique furnace will heat a heavy engine head to 1350°F (cherry red) in preparation for crack repair welding. After the part is welded, it is returned to the Roll-Out furnace to slowly anneal (cool down) to room temperature over several hours. Slow cooling relieves stress in aluminum and cast iron, thus preventing new stress cracks from forming as the work cools. It also prevents the carbon in cast iron parts from turning to carbide and making the metal too hard and brittle to machine. The end result is a casting that is easily machined and repaired. The Buzzer Roll-Out furnace is available in four standard sizes and can be used for both aluminum and cast iron engine head repair. These furnaces are distinguished by high quality and thoughtful design. Each Roll-Out furnace comes lined with industrial quality insulating firebrick, which offers superior abrasion resistance (suitable to a machine shop environment) and retains available heat to ensure optimal slow cooling. The furnace is also equipped with a fabricated stainless steel “roll-out” tray, making quick casting repair possible while increasing operator safety and comfort. Factory installed safety pilot, 100% shut-off safety valve,and digital temperature controls come standard. This recent addition to our line of high quality furnaces is proof of Charles A. Hones, Inc.’s total commitment to developing more innovative heating equipment. Fitted with our top quality cast iron gas burner, this model is a standout among the furnaces industrial companies currently use. 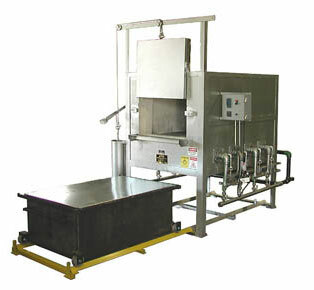 Order your very own Buzzer Oven Type Roll-Out Furnace today!